Michael has recently moved his guiding Base to Te Anau the gateway to Fiordland and the fantastic fishing available there. With my experience and determination to find the best fishing New Zealand has to offer, I will show you the best spots Fiordland and Southland has to offer! The Southland region is blessed with many fine trout streams and many anglers return year after year for their annual fix. 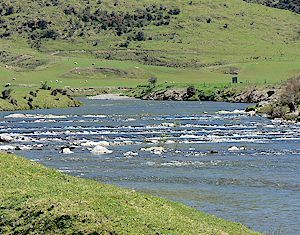 And the world renown Mataura River is one of those special rivers that all anglers will want to visit. 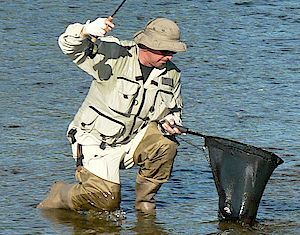 Fishing in and around the lowlands of Gore offers many different opportunities from chasing 1-4lb browns on the famous Mataura during a "mad Mataura rise" where matching the hatch is essential for hooking fish to stalking very large browns on the Oreti where stealth and precision casting is necessary for success. Also with so many small streams and rivers such as the Otamita, Waimea, Waikaka, Waipahi, Waikaia offering their own different individual style of fishing with most of them giving you beautiful views of the rolling hills and lush green farmland of Southland. With so much water and variety locally there's something for everyone from beginner to expert. Traveling times are short which means more time on the water! Further a field, we could be on the Waiau, Mararoa, Von or Eglinton rivers which offer some spectacular scenery and fantastic fishing for the infamous and feisty rainbows.